Outline: The story of Noah. God hates sin and must punish sin. There is only one Person whose blood can make payment for sin. God has provided a way of salvation. Listen and you will hear next about the way of salvation God has made for those who believe and obey Him. Brothers and sisters, I want to tell you how God saved a righteous man who believed His words. God drove Adam and Eve out of the garden. After that they had two sons. These sons were named Cain and Abel. Abel did what was right in the sight of the Lord but Cain did what was evil. One day Cain was angry and killed his brother. Adam and Eve had other children. Many years passed and the number of people on the earth grew and grew. But they became very wicked. They did evil things against each other and against God. God saw that the thoughts of all men were evil all the time. He was sad that He had created man and His heart was filled with pain. Then God made a decision and said, "I will destroy man whom I have created, from the surface of the earth." That was God's decision and He had the power to do it. There was one man who pleased God. His name was Noah. Noah was a righteous man who lived in fellowship with God. He was different in character from the other people who lived when he lived. God spoke to Noah. He said to him, "I'm going to put an end to all people, for the earth is filled with violence because of them. I am surely going to destroy both them and all living things on the earth. I am going to bring a flood on the earth to destroy all life under the heavens. But I will save you and your wife and your sons and your son's wives. So make a big boat for yourself and your family. You must also bring two of every kind of animal into the boat with you." That's what God said to Noah. Noah believed God and obeyed Him. He did everything that God commanded him to do. Noah built a very big boat [SOUND EFFECT OF NOAH BUILDING]. He gathered his wife and sons and the sons' wives together, and they entered the boat. Noah brought two of every kind of animal into the boat. A male and a female of every kind of animal came into the boat. (Name types of animals.) [PUT IN SOUND EFFECT OF ANIMALS.] Noah and his family came into the boat, and then God shut the door [SOUND EFFECT OF DOOR SHUTTING]. Then the rain came. [FADE IN SOUND EFFECT OF RAINING AND CONTINUE AT LOW VOLUME BEHIND THE SPEAKING.] It rained and rained as it had never rained before. For forty days it rained without stopping. The waters rose higher and higher and picked up the boat. All the people who had not believed God's Word were drowning in the water. God was destroying all the wicked people who refused to believe and obey Him. Just as He had said, the whole surface of the earth was covered with water. Even the highest mountains were covered. Every living thing on earth, every animal and every person perished in the great flood. Only Noah and his family and the animals with him were saved because Noah and his family obeyed God. Finally, after forty days, the rain stopped. [FADE OUT RAIN HERE.] 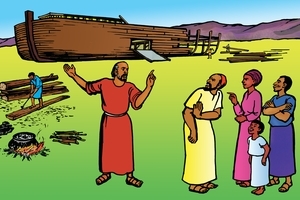 Noah and his family stayed on the big boat and ate the food they had stored with them. The water went down. After five months the boat rested on the mountain. After one year and ten days the earth was completely dry again. Noah and his family and the animals with him were safe. They all came out of the boat. Then Noah gave thanks to God. God saved them because they had believed Him and obeyed Him. This true story happened many, many years ago. God has not changed. He is the same today. Now too he is sad because of the wickedness of people in the world. Though He is sad God still loves them, but He will punish those who sin and refuse to believe and obey Him. God has said that He hates sin. Sin must be punished, but who of us can bear the punishment for our sin? Many people try to cover their sin by doing good deeds. Some people shed the blood of animals. But there is only one Person whose blood can make payment for sin. Just as God gave Noah a way of salvation so he has provided a way of salvation for you today. Each person will face God's judgement after he dies. How will you be saved then? Keep listening and you will hear about the way of salvation God has made for those who believe and obey Him. GRN has recorded a version of this script in 372 languages and dialects. See full list.